"May Day Flower Procession, May Day ca. 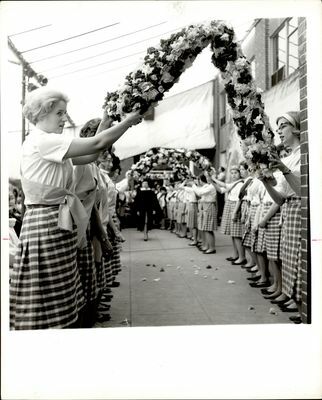 early 1960s"
Students hold a series of arches made of flowers. A student dressed in robes, possibly graduation regalia, is moving through the arches. The photo appears to be taken in front of Trentwell Mason White Hall.